The diet of a racehorse has to be thoroughly planned, carefully managed and strictly adhered to if they are to compete at the highest level. Racehorses require a diet that is high in energy to fuel the levels of performance needed in today’s sport. They must always be well-hydrated, too, even during daily training routines. 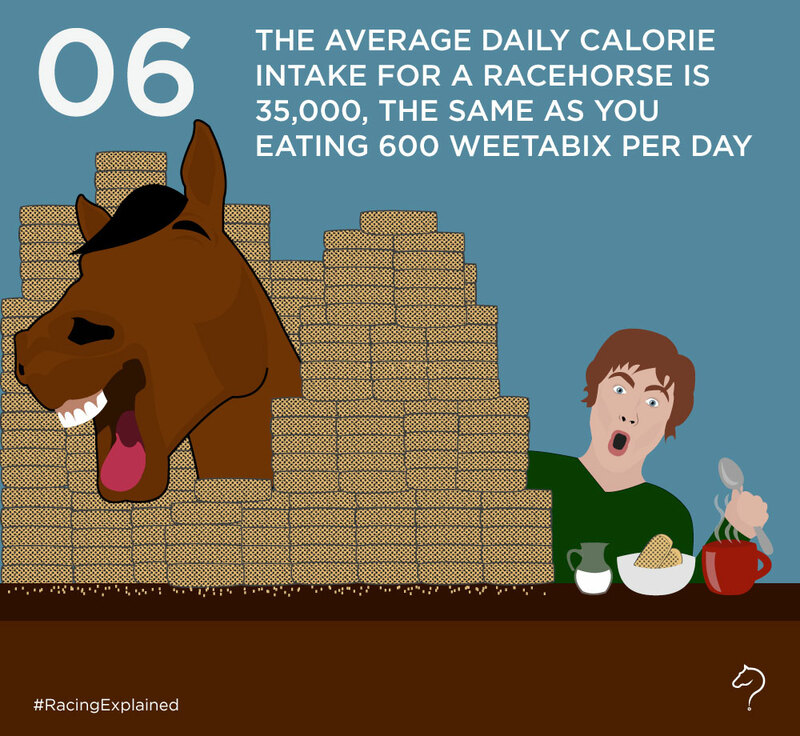 What does a racehorse eat? Like a human athlete, the nutritional requirements of a racehorse are centred on giving them the energy to compete. Without a supply of fast- and slow-release energy, a racehorse may not be able to perform at its best, so it all begins with high-energy foods. When racehorses train and exercise, their muscles use small adenosine triphosphate (ATP) molecules to encourage muscle contraction. One element of a racehorse’s diet focuses on optimising its stores of ATP so that its muscles can keep contracting without getting tired. The best and most important fuels for a racehorse are fat and glycogen, particularly because muscle glycogen is the main fuel used during a race. Therefore, diets high in fat, protein, fibre and starch are appropriate for high-performance racehorses and they can obtain most of these nutritional elements from a combination of forage (grass and hay) and grains, such as oats, corn and barley. What does a racehorse drink? Racehorses need to be thoroughly hydrated, as sweating may cause them to lose between six and eight gallons of water, which translates to almost 10 per cent of their overall water reserves. What is the diet of a jockey? Just like their equine counterparts, jockeys also have to stick to strict diets and training regimes. They must remain at a fit and healthy weight so they often avoid overly fatty foods and carbohydrates, whilst steering clear of calorie-rich things like alcohol. They do, however, require frequent sugar boosts to maintain their glucose levels. This is often achieved through eating jelly-based sweets during breaks in training and drinking tea with sugar at mealtimes.